An irregular column dedicated to sharing the best sights and activities in San Diego at the best price – free! We have a great city and you don’t need to break the bank to experience it. As a stay-at-home father I’m constantly looking for outdoor activities to do with my kids. We frequent playgrounds, the San Diego Zoo, beaches, and spend a lot of time walking around North Park. Recently a friend from Point Loma mentioned that the La Playa beach is a great place for playing in the sand. The name was completely foreign to me and the location (all the way south on Rosecrans until you’re about to enter Fort Rosecrans) didn’t sound like a winner but I decided to check it out. I was very glad I did – the beach is wonderful for toddlers and small children. Behind the south-west end of Shelter Island the water is very calm and the sand is good, if not great. Houses on San Antonio Avenue back up to the beach so there is even some shade from trees which is very rare on San Diego beaches and very convenient with a baby to keep out of direct sun. There is not a view of Downtown, it’s blocked by Shelter Island, but to the south you can see out into the Pacific Ocean and watch ships large and small coming and going. There are a wide variety of activities going on in this corner of San Diego Bay. 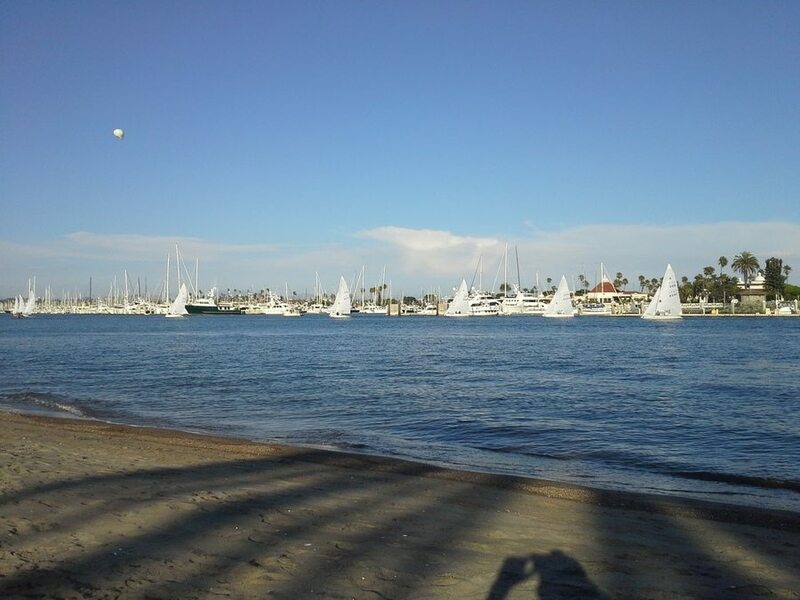 Yachts and sailboats cruise by, paddle boarders are present as well as kayakers, children float on boogie boards, people walk their dogs (or their spouses) – a very active aquatic scene. I recently saw a woman towing her dog on a boogie board back and forth in the water which was really fun to watch. There are a couple of drawbacks to La Playa – there is little parking (on-street only, no lot) and no restrooms. Parking has been very easy on my visits but the lack of restrooms has been an issue with a toddler in potty-training mode. Overall La Playa is a great place to visit in the late afternoon when the shade is most plentiful and you can savor the close of another wonderful day in our great city. It offers a wholly different beach experience from most of the sandy spots in San Diego since it’s so quiet and calm. If you’re looking for a new place to spend a few hours with or without children, I highly recommend it. You know the name of that place is “The Beach” Beach in English, right? I do – the neighborhood adjacent to the beach is called ‘La Playa’ and that’s the way I’ve heard it referred to most often. I found other references calling it ‘Kellogg’s Beach’ and “Mother’s Beach” but couldn’t find a definitive source for the name. La Playa beach is what I heard from Point Loma residents most often so I went with that. I’m not trying to razz you; “Las Playas” was the name of the town in the dumb comedy “Men at Work” (1990) and there was a scene where Emilio Estevez and two local security guards have an argument over “Las Playas beaches” because the title is bilingually redundant. Oh well, beats “Manos: The Hands of Fate”, which in complete English is “Hands: The Hands of Fate.” Worst film about Satanists and family vacations ever made. No ‘razz’ taken, just trying to clarify since there does seem to be some confusion on the official name. I think Kellogg Beach is most correct (at least most used in the Port Authority documents). Spanglish can certainly lead to some bad grammar. . .
Not so much ‘bad’ as completely redundantly un-English. My favorite is any time ‘the’ goes before ‘La Jolla’. For example, the La Jolla Playhouse translates to…. Why do intelligent folks keep doing that? John, Thank you for this. I think it was in the early 80’s that a friend and I took a walk in Point Loma/Shelter Island and came upon that beach. My friend moved away and we lost touch. I’ve always wondered where that lovely little beach was. Tried to find it a few times, but no luck. Now I know exactly where it is and, by the way, you sure have a cute baby! This is right next to the Sub base? I believe so. I’m not really familiar with the different names and functions of the various military facilities in San Diego but the beach is just before you enter the military base that is on the water on the East side of Point Loma. Thanks. Now I know exactly where that beach is. FYI, Sub is short for submarine because that’s the base where the submarines are home ported. John, it is truly a beautiful area and I used to take the kids there often. BUT something surfaced a few years ago that bears looking into. When my husband was diagnosed with cancer, we were invited to attend a meeting regarding others with developing throat cancer. There seemed to be an inordinate amount of this type of cancer, and studies were on-going for several years. The questions asked were many; did Bob fish a lot in the San Diego Bay; Did he dive in the Bay? Did we belong to the yacht club, etc. Because he had lung cancer and not throat cancer we stopped going to the meetings and I have no idea what the upshot of those meetings produced. It might be worthy of looking into to see if there were any final findings, because the numbers of people, for the small area, was staggering. It may have amounted to nothing – but…..
That’s interesting (and sad). I’ll keep an eye 0ut for information on the subject and let you know if I find anything. I posted something related to this issue in the OBRag’s appearance of this article. It is an ugly subject to raise it’s head but would be wrong to ignore. It’s not the SD bay (or even Mission bay) of years past, but is it clean enough for kids to be in? How would we know? Despite the rosy face the city paints on it, I wouldn’t think of allowing family or friends from out of town near that South Shores boat launch ramp park… all is forgotten when it’s 3 meters underground, above a water table… next to a river. The same people that did that occupied industrial spaces all across the bayfront. Most are gone, how much of their legacy sits in the sediment, waiting to be churned up in a good storm or when a large ship navigates the bay channel? See Page 2 for a discussion on the potential Cancer Cluster in Point Loma around the private San Diego Yacht club from 2006. The preliminary Epidemiological result were Inconclusive. Mainly due to a lack of sample size, lack of formal investigation, and HIPPA medical privacy regulations that make gathering medical info hard and incomplete. The area around Kellogg Beach has way more tidal action compared to the Sand Traps with contaminated soils that exist closer to Shelter Island Drive under the private marina areas. I would not go swimming in any closed marina or near parked boats. My dogs and I enter the water at Kellogg Beach, and south of the boat launch ramp on Shelter Island where there is also a strong tidal surge, and lack of sand traps. Through there is no scientific proof one way or the other, the unconfirmed Cancer Cluster may have been the result of leaching of Copper Anti-Fouling Paint that existing in Bay sediments below the pleasure marinas, all around San Diego Bay. There is known heavy metal soil contamination is the Liberty Station NTC Boat Channel. And according to warning signs, it is illegal to swim there. The Boat Channel is also a sand trap and has limited tidal action. Just last Saturday the San Diego Triathlon Classic included a 1,500 meter flat was held in the contaminated waters. Is this data available for public scrutiny? I remember the Mission Bay issue was kept quiet, then brought to light by an eye opening Reader article- so shocking I actually kept the physical copy of the Reader and still have it today. It detailed the original sins of the defense contractors, city waste workers, then in the ’80’s the pure corruption of Pete Wilson and the hired consultants who fudged the figures to attempt a Ramada deal- then it fell through and we lost the chance for federal superfund cleanup. Donna Fry admirably made this part of her platform, had a study commissioned, then the whole thing was forgotten again- surely not by her intent for more malfeasance but because I believe at this stage of the game it’s become too decomposed to safely remove and they just hope for the best. Cancer clusters also reported in residents in the hills of Bay Ho, and didn’t the city have a robotic chemical sniffing dog roaming the park for awhile? It’s amazing how several generations made a mess of some of the most valuable natural and man made waterways on the west coast in such a short time, that will take centuries to undo if it ever can be undone at all. It didn’t have to be that way. They could have trucked the landfill chemicals farther inland, away from underground water sources. The bay is a more complicated matter but each issue could have been approached more responsibly. All of which I guess has gone on and will continue to go on all over the world, from the huge undersea public dumps of the US East Coast continental shelf, to the Shipbreaking debacle in the Indian Ocean coastal waters. The beach is called Kellogg Beach and is named after Kellogg Street the last public street at the south end of Rosecrans before the Point Loma Naval Base. 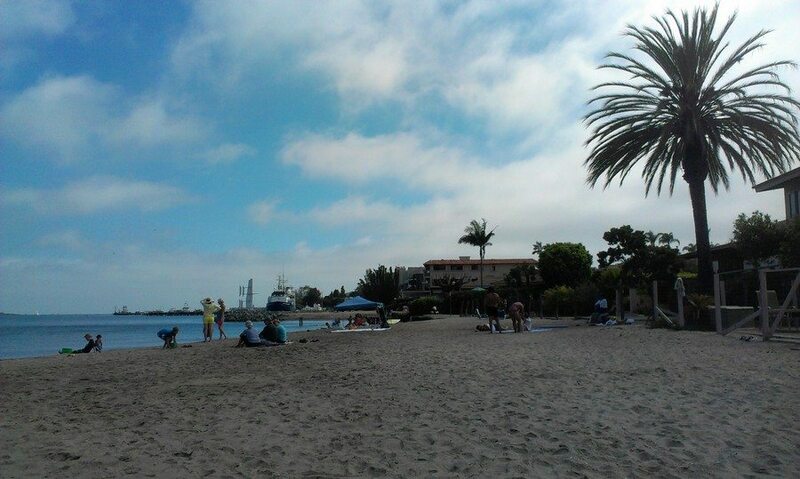 Kellogg Beach is managed by the Port of San Diego and it is located within the original La Playa neighborhood. La Playa and Old Town are the original two residential and commercial subdivisions on the original 1849 Survey by Cave Johnson Couts, before California became a State in 1850. See Page 33 for pictures of Kellogg Beach from the 1920s-1930s when the La Playa Portuguese Tuna Captains docked their ships at the end of McCall Street. La Playa means the Beach in Spanish. When Cabrillo sailed into San Diego Bay in 1542, the San Diego River emptied into San Diego Bay and ship navigation was not possible past “La Playa.” Therefore Cabrillo’s ship the San Salvador had to anchor off La Playa in Point Loma, and the crew had to row to shore. The La Playa Trail (now Rosecrans and Camino Del Rio South in Mission Valley) was the route to fresh water in Old Town. Thanks for all the information – very interesting stuff. Also thanks for confirming the name is Kellogg Beach. Some of the Port documents I came across mentioned Kellogg Beach and La Playa Beach as seemingly separate beaches very near each other but perhaps this was just a mistaken reference. John, Cynthia Conger alerted us to the Cancer Cluster. She might be the one to chat with now. I know that several of our mutual friends have passed on, and the Cluster was always blamed for their deaths. Another little-known gem of a family-friendly beach is the strip on Sail Bay directly in front of the Catamaran Hotel (bayside). “Little known” as in the little-known fact that the chaise lounge chairs and umbrellas provided by the hotel are free to use by anyone, not just hotel guests (I assume, because they are located on the sand, which is public property). Because it’s the bay, there are no waves, so great for little kids. There are also paddle boats for rent right there at the hotel’s dock.